We attended a screening of this film without charge for the purposes of this review. All opinions expressed, as always, are my own. Earlier this week my family and I got to preview the new Disney Planes movie that hits theaters today. We have reviewers in our family ranging in age from 4 to 13, and two adults. After seeing the movie, as is our custom, we discussed our likes and dislikes about the film. Overall we all enjoyed the film. It definitely has a heavy handed influence from the Cars films, keeping many of the same relationship formulas in tact. The adults especially took a few minutes to adjust to the new characters in such familiar roles. The kids seemed to have less of an issue with this. Old dogs, new tricks and such I suppose. The film felt like a combination of Cars 2 and Top Gun for this kids set. I am happy to say that Planes is lacking in the shoot outs that seemed to hallmark Cars 2, leaving it less palatable for the younger set. 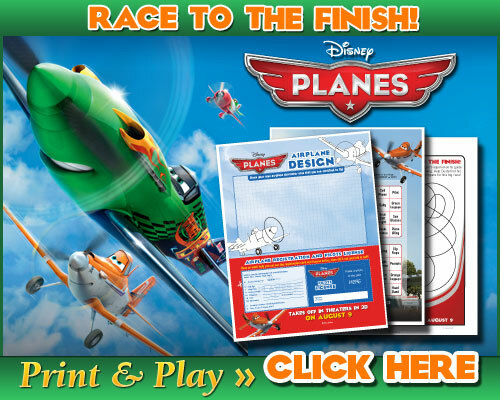 Planes, on the other hand, takes more of the competitive race aspect of Cars, combined with the world rally of Cars 2. Add in what is reminiscent of the flight scenes that got our hearts fluttering in Top Gun in the 80s and it adds a nostalgia factor that most parents can get on board with. Those with young children often ask what is an appropriate age range for a film. I often even get messages and emails asking of such. I am happy to recommend Planes for all ages. Our 4 year old had no issues with the film and it’s “scarier” moments, and a packed theater full of young children had the same reactions. My one “be ready for it” parent recommendation is the ocean swells scene after Dusty leaves the Flysenhower. Planes is a movie we will definitely be adding to our home video collection when it comes out on DVD! Here is the trailer to check out before heading to the movies!